April 16th, 2018: Are single day, employer supported volunteering opportunities beneficial to community partners? As a result, when a company representative – whether the head of CSR or, more often, a regular rank and file employee who is organizing an event for a team – comes to a non-profit asking for a volunteering opportunity for employees, the fundraising mindset often gets activated in that non-profit. As explored in the May Corporate-Community Forum in Calgary, hosted by the Volunteer Canada’s Corporate Council on Volunteering, non-profits examine the request through the lens of how the corporate relationship can advance the non-profit mission. This often includes both how can the volunteer activity impact mission and how the relationship, if cultivated, might bring dollars beyond covering the costs of the volunteer activity. Value their own assets and opportunities. A volunteering experience is very valuable to a company. It is widely understood that community engagement increases employee recruitment, retention and engagement. It helps build teams. It builds employee skills. It can build a brand. Opportunities are formally supported by most large and many small and medium companies and integrated into their community and/or HR strategies. Employees are generally inexperienced – they don’t know how to help a cause and want to do it with a community partner. Non-profits need to recognize that they have more power in the potential relationship than in a fundraising relationship. They have the ability to shape volunteering projects into what serves their mission best, either by negotiating with a company who has come to them or, as several organizations at the Forum have done, pro-actively seeking out corporate relationships for employee skills sets and vision alignment. 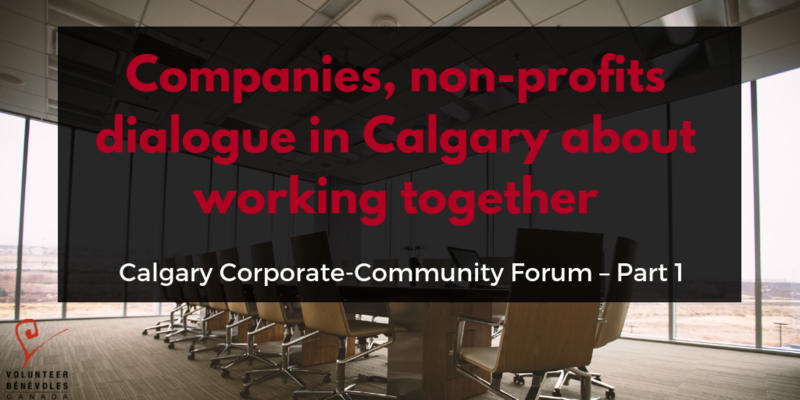 Changing the conversation: The first of a 3-part blog, based on a Calgary meeting of non-profits and companies to discuss corporate volunteering. As keynote speaker Jocelyne Daw of JS Daw & Associates noted, corporate volunteering is quite new, having only enjoyed popularity in the last 10-15 years. When discussing the pros and cons of employer-supported volunteering, the conversation focused on the most common aspect of corporate volunteering: single day group volunteering projects for employees. Corporate representatives enquired, “are done-in-a-day opportunities useful to the charity?” The short answer is, it depends on several factors: the organization; time of year; how many volunteers; and the activity. The volume of donations going in and out of the Calgary Foodbank, for example, means they really benefit from a large group who can help them out for a day. Alternatively, painting a wall at a charity – a task readily available as a response to a group offering to volunteer – may not be as valuable a contribution and too often a default for non-profits who don’t want to decline an offer of help. For some non-profits, regular commitments from a company are easier to manage than “one-offs”. Before contacting a charity, companies should start with the question, why do we want to volunteer? Then ask non-profits what they have to offer and find the most impactful way to help at the organization, rather than trying to force a project. In the session, “Beyond another coat of paint”, longer term commitments between companies and non-profits on working together with employee volunteers were discussed. Most of these projects involve multi-day involvement of employees, use of employee skills, and a monitoring and evaluation process between the charity and the company. One example is the “In the Lead” program, co-created by Cenovus with Calgary Youth Justice Society. Now in its 7th year, this program pairs Cenovus Energy employees with youth as volunteer coaches. At the end of the program there is a graduation ceremony and plenty of encouragement for the youth. 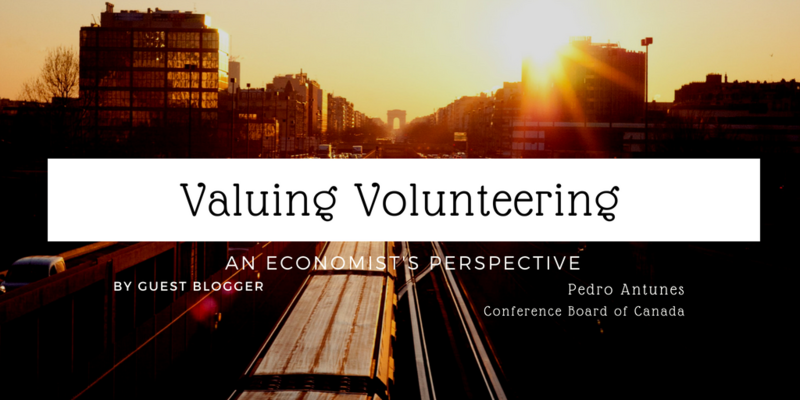 The longer the volunteer opportunity, the more likely employee contributions can be measured, tracking outcomes and impact, rather than just the outputs such as numbers of volunteer hours or the nebulous ‘lives impacted’ measure. With planning, non-profits and companies can identify measures and indicators, quantitative and qualitative, that can prove impact and give information to improve impact. A theme throughout the day was the question of refusal. Can a charity say no to a company’s request and what is the potential fall out (the most prevalent being a concern about being denied future funding)? In most but not all cases, a request to volunteer comes from an employee who volunteered or was assigned to plan the opportunity, not CSR department staff. Several companies attending confirmed that there is no tie between denying – or accepting – a volunteer request and a donation from their companies, apart from funds to support the costs associated with the volunteering project. Amongst the reasons for non-profits to reject a corporate group seeking to volunteer, the most common discussed was timeline. It takes time to plan, execute the project and onboard volunteers. Reaching out just a few weeks before causes stress for the non-profit. In the relatively new space of corporate volunteering both non-profits and companies benefit from sharing information and learning from each other. Enter the discussion truthfully (be honest that it’s an activity for a company team building day or your capacity as a charity) and seek to understand what the other party gets out of the opportunity. Companies, start enquiring about a project early (with at least 6 weeks lead time) to not rush the process and allow for an honest discussion. And, as many of the inquiries for volunteering come from employees throughout the company, companies need to create guidelines and even training for these employees so that they enter conversations with non-profits sensitively and realistically. In our next blog, we look more deeply at the ways to “change the conversation between company and non-profits” as discussed by the Forum participants. National Coaches Week focuses on celebrating the efforts of the 5.3 million volunteers from Canada's sports and recreation sector including coaches, referees, administrators and helpers. 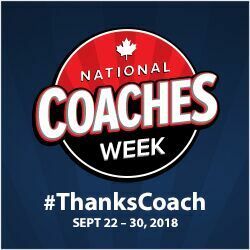 We encourage you to say #ThanksCoach and share why you’re thankful for your coach during National Coaches Week from September 22nd to 30th. Volunteer Training is essential not only for coaches but all volunteers. It's vital to ensure that volunteers gain the knowledge they need to succeed. In fact, volunteer orientation and training is one of the ten standards outlined in the Canadian Code for Volunteer Involvement (CCVI)! Volunteer Recognition is a part of making sure new volunteers feel welcome, it may also be beneficial to review Recognizing Volunteering in 2017 to learn how you can recognize your volunteers at every stage. For some help in planning volunteer onboarding and training, take a look at this New Volunteer Checklist. 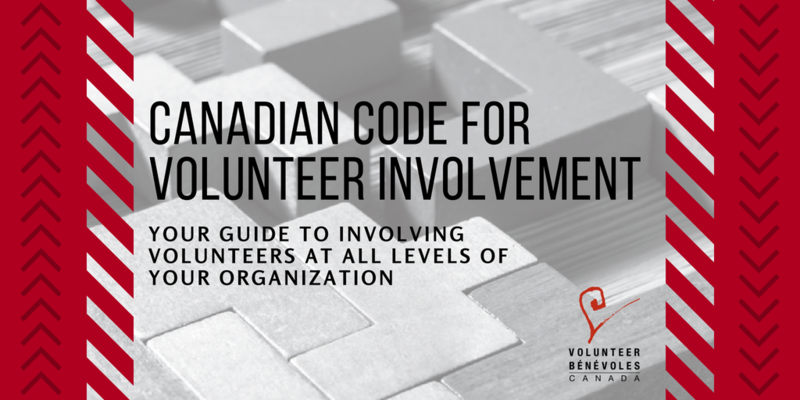 You can also refer to the Canadian Code for Volunteer Involvement - Putting the Code into Action resource. Regardless of the nature of the event you are planning, there are always procedures, permits and risks an organizer must consider. If you’re not a professional event planner, nor a member of a formal organization, it’s not always clear as a volunteer what responsibilities you hold when hosting a public event. Have you considered what you would do and the implications if you had to cancel your event or someone injured themselves? But, you’re doing this out of the goodness of your heart. What are the odds of something happening? And even if something does happen, you’re a volunteer! Surely, you’re not responsible… Right? In fact, as the person or group responsible for organizing the event it is your responsibility; it’s your job to make sure that you have minimized any risk and that you have adequate coverage in case something does happen. How do you know what risks to plan for? That’s where we come in! 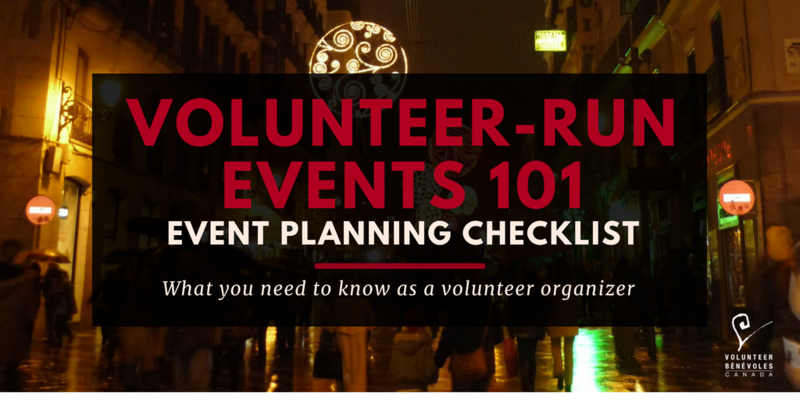 We made an event planning checklist that provides the main elements volunteers need to know when planning a public event of any kind. This list isn’t exhaustive but, it’s a good starting point for you and your planning committee. Contact any groups, companies, agencies or governmental bodies that have any direct or indirect involvement in the event so you are aware of any regulations or requirements they have and so you can communicate your needs to them. Parking: Determine any cost associated with parking, the parking location and any capacity limitations. Signage: Ensure you have clear and adequate signage so your guests know where to go. Registration Area: If your event requires on-site registration, establish where this takes place and what the process will be. Admission: Is the admission regulated in any way, or is the event open for all to come and go as they please? Tickets & Price: Determine the cost to attend. Will there be a ticket system? Theme & Décor: The event’s look and feel. Floorplan: Will you have tables? Assigned seating? Do you have enough chairs for your guests? Where will they be and is there enough room for all the attendees? If you do not plan on having chairs, consider what kind of accommodations you will offer to attendees who may have mobility limitations. Music (SOCAN Fees): Will you be playing music? What are the applicable SOCAN fees for your event, if any? Are these fees already included in your venue cost? Audio-Visual Requirements: Know your technical needs regarding a sound system, lights, projection, microphones, etc. If you don’t have this expertise, seek it out. Extension Cords: In our experience, you will likely need at least one extension cord during your event. As the Boy Scouts famously say: Be Prepared! Linens: Table cloths, napkins or chair covers. Master of Ceremony: A designated person responsible to guide your audience through the event is helpful to keep your guests engaged, informed and at ease. Entertainment: What are you offering your guests as entertainment? Activities Schedule: This can be as flexible or precise as you need it to be. Having an established timeline and order of activities ensures guests, volunteers and organizers are aware of what is happening and when. Volunteer Management: Even as a volunteer yourself, effective volunteer management is crucial to ensure your fellow volunteers are set up for success. Position Description: Map out the requirements and expectations for each volunteer role you will need to fill. This allows any volunteer supervisors, coordinators and volunteers to understand their tasks and contribution to the event. It also allows you to foresee any gaps or redundancies in responsibilities. Screening: Will you serve vulnerable peoples with your event? Do your volunteers require police checks? Do your volunteers have skills or interests that are best suited for certain tasks? You can learn more about screening in the Screening Handbook. Orientation: Where, when and how will you provide your volunteers with relevant event information and guidelines ahead of the event? Schedule: Establish a schedule so your volunteers know where to be and when. Meals: Is your event taking place during meal time, or will shifts last more than 4 hours? Consider how volunteers will eat, if you are providing their food, if they are bringing their own or if they will purchase their food on-site. Recognition: What kinds of recognition will you offer your volunteers before, during and after the event? Learn more about effective volunteer recognition here. A Vendor Permit may be required if you plan on selling goods or services as part of your event. Contact your municipality or appropriate governmental body for details. Note that some of these permits can take up to several weeks to process. Be sure to apply with enough time to receive your permit several days/weeks before your event. Ramps / Stairs / Handrails: What are the risks of a fall? Is your event accessible to people with limited mobility? What accommodations are available to them? Adequate Time: Plan for enough time between activities, especially if your guests will be travelling from one area to another to avoid causing a traffic jam of people. Space between tables: Make sure servers holding trays and people with mobility aids (ex: crutches, walker, wheelchair, etc.) have adequate room to circulate between tables and around the room. Fireworks & Bonfires: Follow local burn guidelines on the day of the event, monitor the weather conditions and wind and, ensure only adequately trained volunteers or contractors are operating fireworks or managing the bonfire. Serving Liquor: Ensure all volunteers / servers serving alcoholised beverages are appropriately licensed (if required by law). Understand your mandated responsibilities and the applicable laws as a host selling alcohol. Emergency Plan: Does your venue have an emergency plan? What happens in case of extreme weather? What procedures should your volunteers follow and what guidelines will be communicated to guests? Insurance Needs: Things to consider from an insurance coverage perspective. It’s important to have insurance in place ahead of time, however you can also purchase it right up until the day of the event. Venue Required Liability Limit: Most venues will require you to have event insurance in place, including a specific limit of liability. This may differ if your event is at a private venue or a public event. Typically, a venue will require a liability limit of $2,000,000. Venue Named Under your Policy: Does the venue need to be provided with a certificate of insurance naming them as an additional insured under your policy in the event of a loss? Cancellation Insurance: This will protect you in case of unforeseen situations such as inclement weather, if a venue is deemed unusable, or if something else requires you to cancel an event. This coverage can help you recover many of the costs and deposits already paid. Waiver of Subrogation: This prevents your insurance company from recovering any funds from the venue if the claim was due to their negligence (an additional premium may apply). Liquor Liability Insurance: This is sometimes necessary, especially if your event is taking place in a venue in which the bartenders are not covered. Liquor liability covers arising from causing or contributing to the intoxication of a person; the accidental furnishing of alcoholic beverages to a person under the legal drinking age or under the influence of alcohol, or any statute, ordinance, or regulation relating to the sale, gift, distribution, or use of alcoholic beverages. Each event is different. 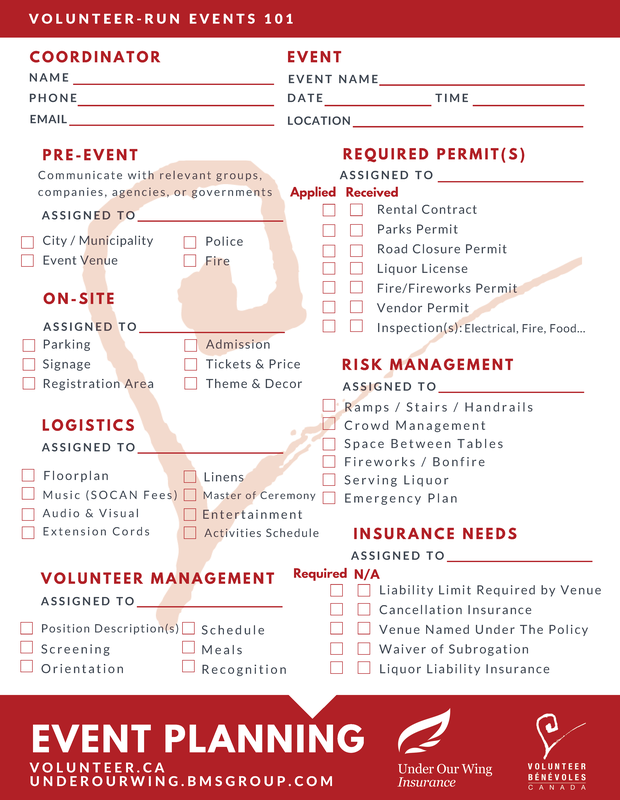 Not everything on this checklist will apply to every event, and this checklist does not include every consideration needed for each event. What this checklist does provide, is a framework to start thinking about your event planning process in greater depth and with more awareness of the kinds of risks you need to manage. Happy Planning! Volunteer Canada members have exclusive access to leading event insurance through BMS and the Under Our Wing Insurance Program. Contact a Broker today to discuss coverage options best suited for your event. You will need to provide them with the specific details, such as the number of attendees, time and date. The policy covers the organization that takes out the policy and all parties involved in the event (venue, caterer, event planner, etc.). Event insurance also provides general liability coverage for specific events. Additional coverage can also be purchased for such things as event cancellation and liquor liability. Pedro Antunes leads a team of economists responsible for the production of the Conference Board’s suite of economic forecast products, as well as other reports and economic indicators that relate to Canada and its regions. Mr. Antunes is a spokesperson for the Conference Board and has provided expert testimony before parliamentary committees. He makes numerous presentations on economic topics and dialogues with Canadian leaders, the public and media about issues important to Canada. But it’s not just the organization or focus that makes things special and meaningful – it’s also the attitude behind it. Volunteering is more than just giving of your time; it’s giving of your caring. It’s value added to an existing event. It’s contributing your effort and skill to right a wrong, raise funds for an under-supported cause, and demonstrating through your work- and presence!-that people care. So no licking envelopes or handing out flyers for this bunch! We've got bigger and better things in mind. Have you ever wondered how volunteers get connected to the places they are needed the most? Who makes sure all the gaps are filled, that events get coordinated and that volunteers are being given opportunities to meaningfully contribute? 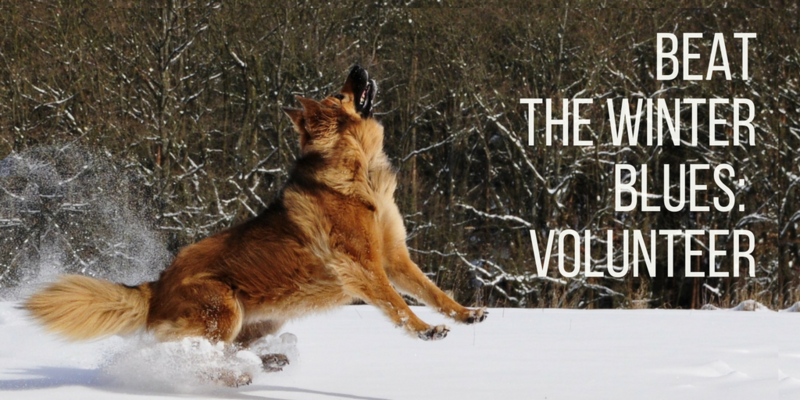 In many cases, the answer is that a coordinator or manager of volunteers is behind the scenes! These volunteer resources management professionals are an important part of the volunteer sector and today during National Volunteer Week we want to put the spotlight on the value they add! We spoke to Lola Dubé-Quibell, a Coordinator of Volunteer Resources at Ottawa Public Health with more than 15 years of experience in the field of volunteer management and a lifetime of experience as a volunteer herself, about her role and how she has seen the wide reaching effects and positive impact of Canadian volunteering. So what exactly is her role? Simply put, her role involves fulfilling an expressed need by engaging volunteers. In the context of public health, an example of that could be mothers who are struggling to breastfeed. A healthcare professional such as a nurse would assess the mother’s needs and then contact Lola to find a trained volunteer to assist the mother. Specifically, from a public health point of view, Lola believes volunteering can help address some of the inequities of the determinants of health. Determinants of health are social, economic and environmental factors -- including things such as education level, support networks, health care access and income level -- that determine people’s ability to live a fully healthy life. Volunteering can contribute to improving these factors. For example, a library volunteer may suddenly have access to resources and knowledge they were unaware of previously. A volunteer at a community theatre is exposed to art, culture and new community networks. These are just two examples of how volunteering can enrich the life of a volunteer and increase their access to things that improve their quality of life, health and happiness. On the flip side, it is evident that volunteers also contribute to the health of the clients they serve through their volunteering jobs. Lola refers to this as knowledge transfer and knowledge mobility. The volunteers acquire new knowledge, access, skills, and networks and build confidence through their community contributions: knowledge provided by professionals, trainers, coordinators and other volunteers. They then are able to put this new knowledge into action at their volunteer placement and pass it on, sharing it with those they serve. Furthermore, every volunteer has their own sphere of influence; the things they learn while volunteering do not stay at their volunteering placement but are instead taken and shared with the people they know in other areas of life. The value of volunteering has a ripple effect that spreads widely and continuously gains momentum. Managers and coordinators of volunteers are one piece of the volunteering mosaic that help get the ball rolling. They excel at capitalizing on the value of volunteers, especially connections, making sure volunteers are placed where they are most needed. Thank you to Lola for giving us an insight into her role and from all of us at Volunteer Canada, thanks to all professionals in volunteer resources management. We celebrate the value you add to volunteering! 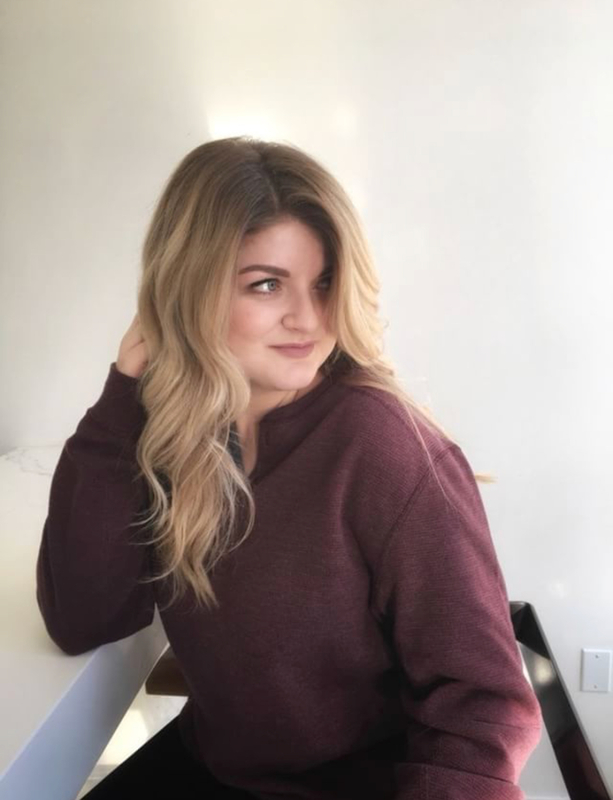 My name is Rosie Krause, I am a Masters of Arts Candidate in Legal Studies at Carleton University. My undergraduate degree was also from Carleton, an Honours Bachelor of Arts in Child Studies with a Minor in Psychology. In my third year of my undergraduate degree, I decided I wanted to go to graduate school and was told point blank by a student success worker that I couldn't do it with my current grades and involvement. So I set out to prove this person wrong - and I did. I reached out and got support from student services, got to know my professors, and started getting involved with non-profit organizations in youth oriented areas. Since 2015, I have been speaking on how to get involved and the importance of volunteering, mostly in Dr. John Weekes' Addictions course at Carleton. I have mentored many students,and helped them secure volunteer positions in various organizations. While it cannot be understated that volunteering is crucial to the functioning of most non-profit organizations, it is also vital that volunteers gain useful experience for themselves in the process. I always say in my presentations that there is no shame in being straight forward with agencies about what you can give, and what you need to get from your volunteer positions. Volunteering is an opportunity for you to contribute your skills, knowledge and passion to an organization, and for you to learn and develop yourself. Having the motivation to grow and learn as a volunteer is not only acceptable, but encouraged. Employer-Supported Volunteering (ESV) is any activity undertaken by an employer to encourage and support the volunteering of their employees in the community. There are a multitude of options and strategies for employers to engage their employees. Employers may enact company-wide days of service, flex time, rewards programs or even microvolunteering. It is in the employer’s best interest to offer some support as 68% of Canadians would choose a job with a company that has a strong volunteering culture over one that does not. Most common amongst ESV is an opportunity where a group of employees visit a community partner for a full day or half day to complete a ‘hands on task’. The task depends on the community partner, but common examples are outdoor clean up projects, serving a meal, or packing items for distribution. For community partners, the benefit of offering single day opportunities is sometimes disputed. Some use them effectively to advance their mission, either through fulfilling day to day needs or a new project not possible without the company injection of volunteers and financing for the project. Conversely, some community organizations feel that planning and managing employee groups are a drain on finite staff resources, that projects are not impactful, and the usually hoped-for prospect of a longer-term corporate partnership or community investment never materializes. In fact, Volunteer Canada research shows that agreeing to – or rejecting – a request to engage employees volunteering almost never figures into company donations or sponsorship decisions. For some community partners, due to space constraints or the nature of their mission, it may not be in their best interest to offer single day volunteering. For others, we propose a realignment. Rather than viewing the opportunity solely as an interaction with a corporate entity, view prospective volunteers as members of the community. With the rise of Individual Social Responsibility, employers are increasingly allowing their employees to lead volunteer days, rather than a top down model. Most likely the lead volunteer requesting the opportunity is passionate about supporting your organization’s focus. The composition of volunteers will likely be diverse, some having never volunteered before or at least not since high school and with different motivations - some may have signed up just to be sociable. 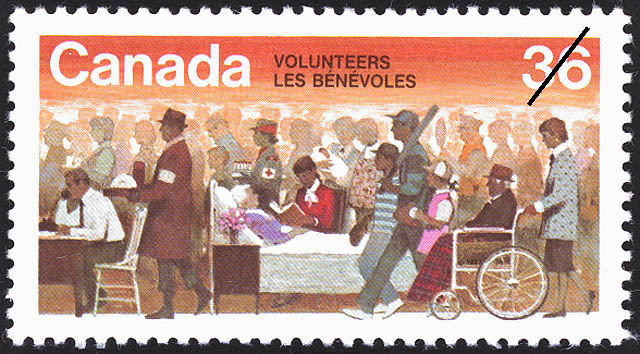 According to Statistic Canada, only 44% of Canadians volunteered in 2012. Your single day volunteering experience encourages these employees to learn about their community, develop prosocial behaviour, experience the joy of altruism and potentially put them on a path to find something they are passionate about in order to continue volunteering. For some employees, it may be the beginning of a longer volunteer commitment with your organization. At a minimum, employer-supported volunteers may learn about the community partner and who they support. Chris Jarvis, co-founder of Realized Worth, divides group volunteering experiences into two categories - transactional and transformational. What elevates an experience into a transformational one is to effectively communicate why the task accomplished by volunteers matters and bring to life who it benefits. In all of these ways, employer-supported volunteerism has the potential to embody each of the elements we are recognizing in this year’s National Volunteer Week theme “Celebrate the Value of Volunteering - building confidence, competence, connections and community”. By opting for a model that focuses on the quality of experience for volunteers versus a stepping stone in a relationship with the company – community organizations can best approach the volunteering request through how the activity benefits their mission and how it builds engaged citizens. Volunteering reflects our values – what we care about, our vision for our community, our notion of justice, and our sense of responsibility for the planet and all those with whom we share it. Volunteering also generates value for organizations, neighbourhoods, businesses, society, and for those volunteering. It is the interplay between what we value and the value that we create through our actions that is behind the Value of Volunteering Wheel. How do we begin to demonstrate the complex value of volunteering? It has become common place to use a wage replacement formula, multiplying the number of volunteer hours by an hourly wage (using minimum wage or industry pay rate scales) and to come up with a dollar value for the volunteer time. Others have tried to calculate the fair market value for the service provided (a tutoring session, a meal delivered, a strategic planning session facilitated). While talking about the thousands, millions, or billions of dollars worth of time or service given captures peoples’ attention, it still falls short of capturing the full story. Volunteer Canada recognizes the need to demonstrate a clear measurement of the value of volunteer time and volunteer programs and that in doing so, valuing volunteerism will take many forms. Determining the impact of the contribution of volunteerism is complex and multifaceted and Volunteer Canada believes that any measurement on the value of volunteer involvement must be framed with a social return on investment that integrates both qualitative and quantitative measurements. Both aspects of measurement must be considered equally valid and compelling and each measurement presented in isolation of the other presents an incomplete picture of the true value of the contribution of volunteers. Volunteers provide value to organizations through their leadership and governance, setting strategic direction, raising needed funds, forging alliances, and executing fiscal oversight. Board members can raise the profile of the organization, open doors, and bring pertinent perspectives from members and stakeholders. The value of a board’s role goes well beyond the number of hours spent preparing for and attending meetings. Volunteers also bring cultural competencies to an organization that expands its capacity to serve diverse populations and creates a bridge with new communities. The value of this is well beyond the volunteers’ time. And of course, many volunteers provide direct services that increases the impact of their programs. Neighbourhood associations, both formal and informal, provide a platform for people to shape the places and spaces where they live, work, and play. Areas with high levels of community engagement tend to be safer and more resilient. Whether we look at value through the lens of concepts such as social capital (the value of people forming bonds with one another and bridging to the community at large) or from a community asset-mapping perspective (space, resources, peoples’ commitments and talents…), volunteering has high value and it is well beyond the hours neighbours spend cleaning the park, flipping burgers at the BBQ, or taking a shift in the homework club. One third of the 12.7 million Canadian volunteers indicate that they received support from their employers (paid time to volunteer, group volunteering activities, donations made to organizations where they volunteer, etc.….). Employee volunteering programs, in addition to contributing to the community, help businesses recruit top talent, enhance employee engagement, improve work place morale, and augment their profile and credibility. The value to businesses goes beyond the cost of the hours that employees volunteer. Volunteers lead important public policy campaigns that have had significant impact on our society in areas including impaired driving, end-of-life support, and the use of pesticide in public spaces. The impact of these legislative changes impacts peoples’ health, wellbeing, and saves lives. The value of volunteers goes well beyond the hours they spend meeting with politicians, organizing rallies, and writing to policy makers. While volunteers give their time to contribute to the community, many report on benefits such as learning new skills, gaining experience, feeling connected to their community, and improved self-esteem. Many volunteers attribute their success in their education and careers to the experience and connections they have made while volunteering. Studies have shown that volunteering improves brain health and prevents social isolation in older adults. These benefits go beyond the hours volunteers give to communities. 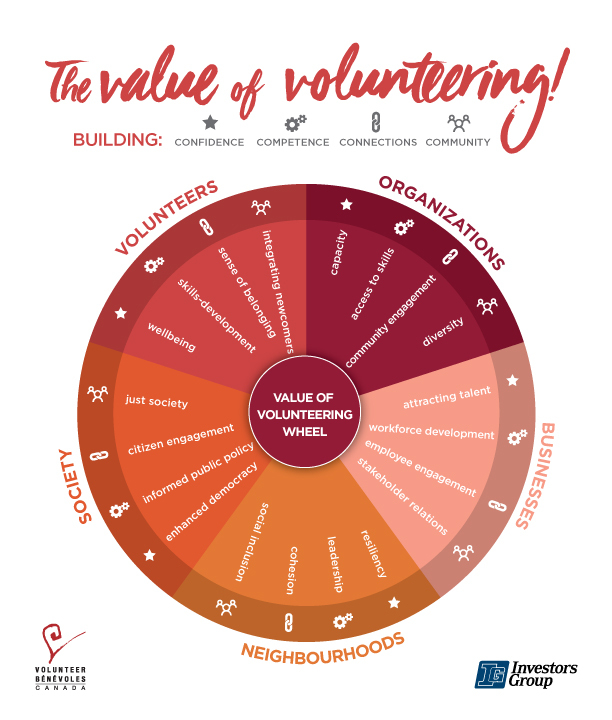 The Value of Volunteering Wheel is designed to illustrate the many values and to help you explore the many studies, tools, and resources on the value of volunteering. National Volunteer Week shines a light on the 12.7 million Canadians who volunteer their time. We are Celebrating the Value of Volunteering in building confidence, competence, connections and community. Au nom de Bénévoles Canada, Groupe Investors, et la reseax des 220 centres d'action beenvoles, nous vous souhaitons un bonne semain de l'action bénévole. Nous célébrons la valeur du bénévolat - en renforcons la confiance, la competence, les liens et la collectivité. Aux 12.7 millions bénévoles au Canada, MERCI!!!! On behalf of Volunteer Canada, Investors Group, and the 220 volunteer centres, thanks to Canadians who volunteer in every region and around the globe! Archived Blog posts are coming soon!